Tuva, the Siberian republic which borders Mongolia, is the only region in Russia to experience independence. Photographer Max Sher visits the predominantly Buddhist region for its 95th anniversary. There is just one road that connects Tuva with the rest of Russia. 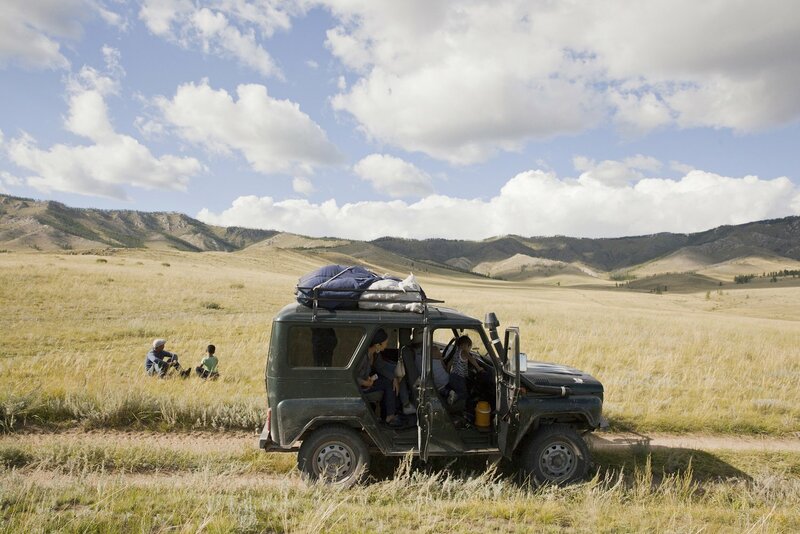 To reach the remote republic, which borders Mongolia to the south, you first have to fly to one of the nearest Siberian cities — Novosibirsk, Krasnoyarsk or Irkutsk — then take another flight or car ride over the scenic Sayan Mountains. The border region’s history is much more complex. Tuvans are believed to be of Turkic, Mongol and Samoyedic descent. Uryanchai, the area that is now Tuva, was alternately ruled by Turkish, Uyghurs, Kyrgyz, Mongolian, Altyn and Chinese dynasties. Up until the early 20th century, Tuva was part of Mongolia, which was itself a vassal to China. In 1914, after a brief period of nominal independence, it became a Russian protectorate. It is the only region in Russia to experience independence: the Tuvan People’s Republic existed from 1921 until 1944, the year it was integrated into the Soviet Union. The region continues to celebrate its Independence Day (called “Republic Day”) in August. Photographer Max Sher, who has made a career documenting the breadth of everyday Russia, travelled to Tuva for its 95th anniversary of independence. To create his portrait of Tuva, he visited its capital of Kyzyl (home to just over 100,000 people), as well as smaller towns such as Chadan and Turan, the Kachyki valley near the Mongolian border, and photographed its maginifent wilderness. He says that many Russians forget that this predominantly Buddhist region is even a part of Russia: “Tuva is still perceived as exotic, as an Other, even as a foreign place. There are those who value Tuva’s rich historical heritage but look at Tuvans with imperial arrogance. Then there are others searching for enlightenment who call Tuva ‘the Russian Tibet’.” Sher is hesitant to call it this. Back in 2014, he spoke to The Calvert Journal about wanting to inspire a shift away from the sublime and celebrate everyday imagery of Russia instead. Though his photos of Tuva feature shamans, yurts, horse races and wrestling competitions, he insists that life there is not different to other parts of the country. “Capturing the everyday is easy when you concentrate on what is similar or common in terms of people’s experiences, economy, the vernacular architecture or infrastructure, and there is more of that in Tuva than of something that is perceived as unique or different,” he reveals. 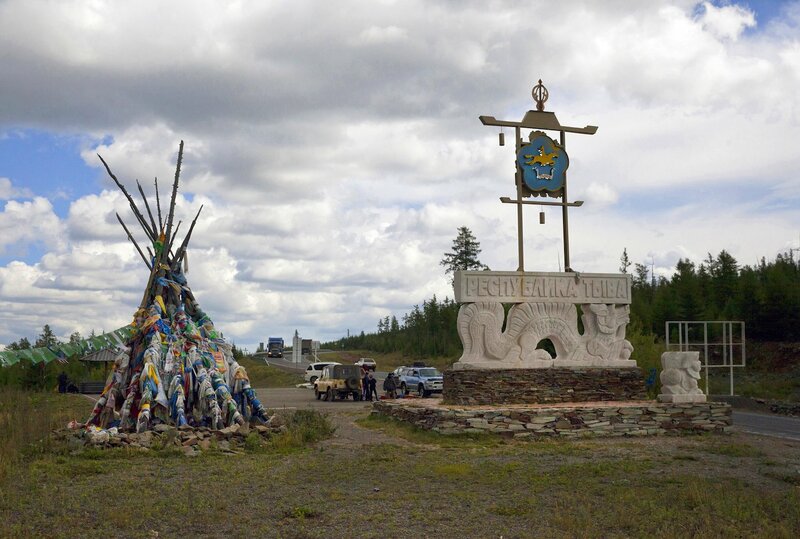 The entrance sign reads “Republic of Tuva” in Russian and depicts a Chinese-style dragon and the region’s coat of arms — a yellow horseman; to the left is an ovaa — recognisable by its Buddhist prayer ribbons and blessing scarves. Tuva was once part of the Chinese Qing Empire and the Chinese cultural influence, although largely forgotten, is palpable in landmarks such as this. 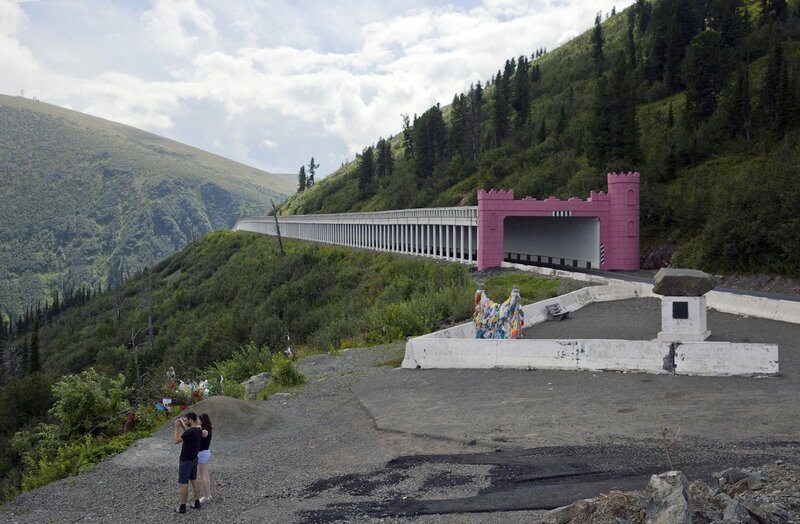 Tourists take a picture near “The Shelf”: an anti-avalanche tunnel on the scenic M-54 highway in the Sayan Mountains. The M-54 is the only road connecting Tuva with the rest of Russia. 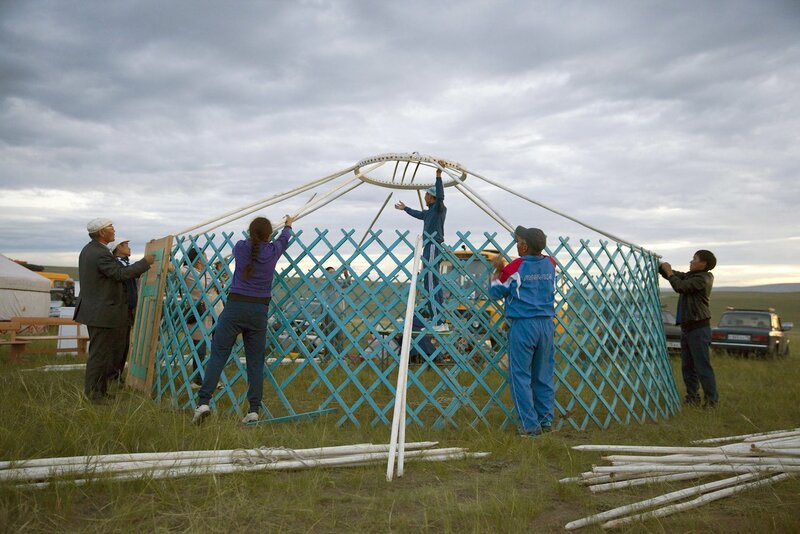 Farmers build a yurt for the annual farmers’ festival called Naadym (pronounced Nah-Dim) in Tos Bulak. The festival is an important element of today’s Tuvan identity and includes various competitions such as horse racing, arching, wrestling, as well as yurt building and cooking contests. During the Soviet era, Naadym and other Tuvan traditions were largely banned. Choiganmaa, a journalist, and Shoraan Kuular, a stock farmer, celebrate their wedding at a pagoda outside the capital Kyzyl, where its future railway station is supposed to sit. An obelisk by artist Dashi Namdakov marking what is believed to be the geographical centre of the Asian continent. Why exactly this place was chosen as such remains unknown but a Russian engineer who authored a 1910 book about Tuva mentioned an English traveler who had come to the area willing to see the “center of Asia”. The confluence of Kaa-Khem and Piy-Khem rivers which form Yenisei — Russia’s longest river — is visible in the background. 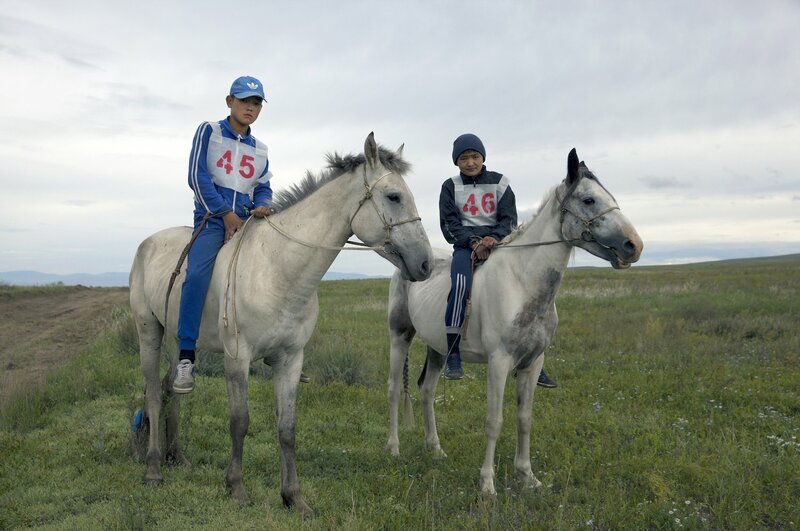 Brothers Salgyn, 14, and Kheimer, 13, Dongak prepare for the annual 15 km horse race as part of Naadym farmers’ festival. Both Salgyn and Kheimer have been jockeys since the age of 8. Race rules allow neither saddles nor helmets. “If we wore them, we would be laughed at,” the brothers said. Shaman Nikolay Öorzhak pictured in his Kyzyl office. Originally trained as a stage designer in Moscow, he later served as art director of the Tuvan National Theater in Kyzyl. 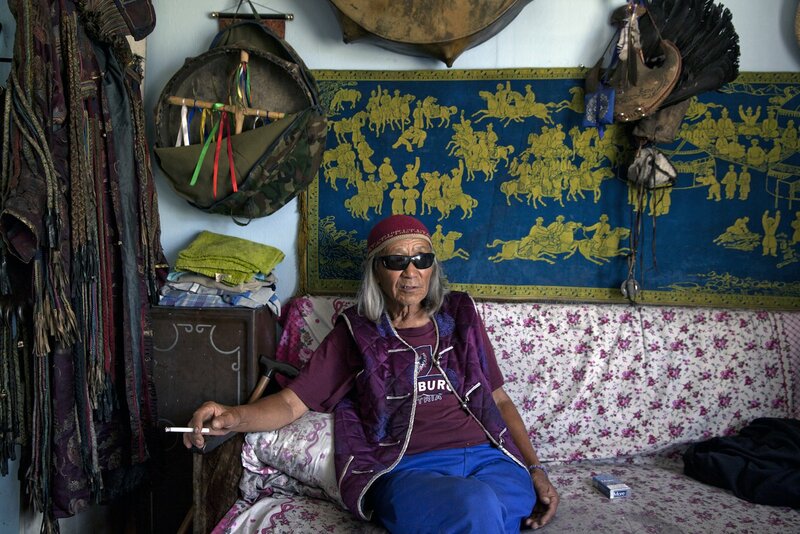 In 1990, he founded Tuva’s first community of shamans. “You can understand shamanism only if you become a shaman yourself. Shamanism is not a religion,” he says, “it is a foundation of all religions. God is the energy of the universe, all else — Buddha, Christ — are just images.” Mr Öorzhak says he receives many Western visitors, mostly psychologists, and has traveled extensively around the world. Members of the Bandan family take a rest on the way to their nomadic station. Bayir-Kys Banchyk and Valentina Sambyr demonstrate the traditional way to tan cowhide which is used to make shoes. Such craft traditions survive only in isolated communities such as this one in Kachyk river valley in southeastern Tuva. 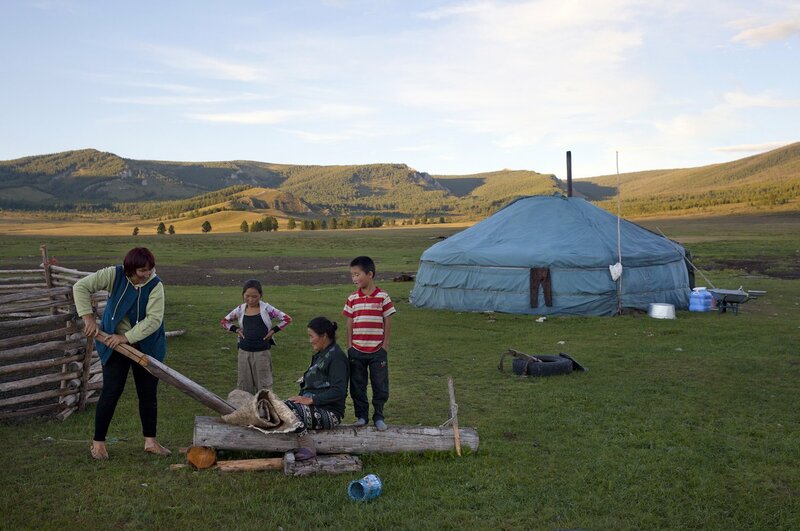 Alimaa and Ertine Bandan, 28 and 29, with their sons Bimdorch, 9, and Sayin-Belek, 3, pose in front of their family yurt. 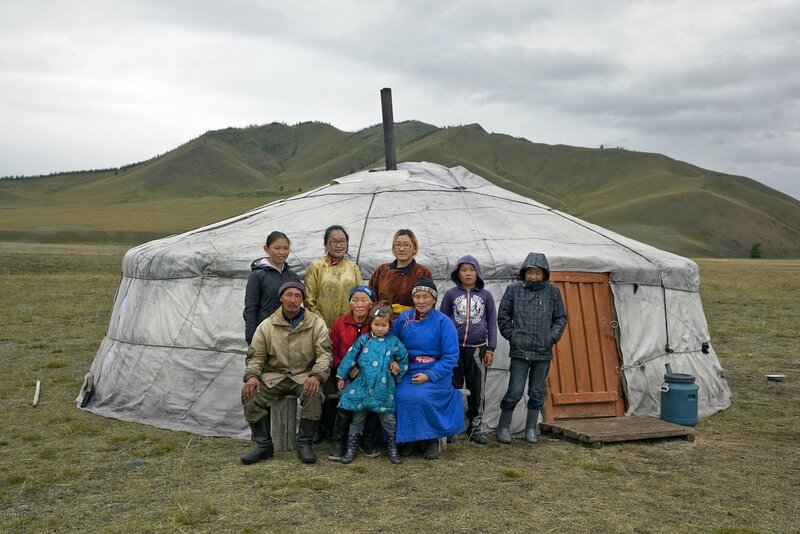 In summer, they live in this yurt in the Kachyk river valley. In fall, they return to the nearest big village of Naryn — some 100 km away — where they also have a house and where Sayim-Belek goes to school. Together with Ertine’s parents and other relatives, the Bandan family keeps more than 2,000 stock — mostly sheep, cows and horses. They have about 80 hectares of private land and rent more land for a winter station. Alimaa also makes traditional Tuvan skin and wool clothes mostly for family use. Ertine says: “I like it more when we are here in the valley, living in our yurt. I am my own boss here, there is no authority above. We all know each other here and live together peacefully”. Khuresh — a traditional wrestling competition — is held as part of the annual farmers’ festival Naadym. An assistant referee holds the wrestlers’ caps as a sign of respect. 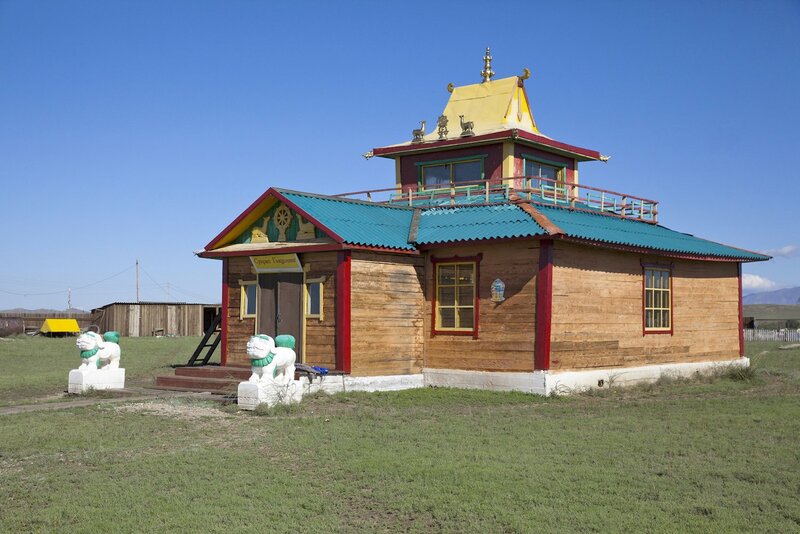 A Buddhist sanctuary, Sunrap Gyatsoling, in Erzin near the Mongolian border. When Tuva was absorbed by the Soviet Union in 1944, the monks were arrested and the temples destroyed. After the breakup of the Soviet Union, Buddhism experienced a revival in Tuva, although marred by expulsions of popular foreign preachers and tight control on the part of the government. 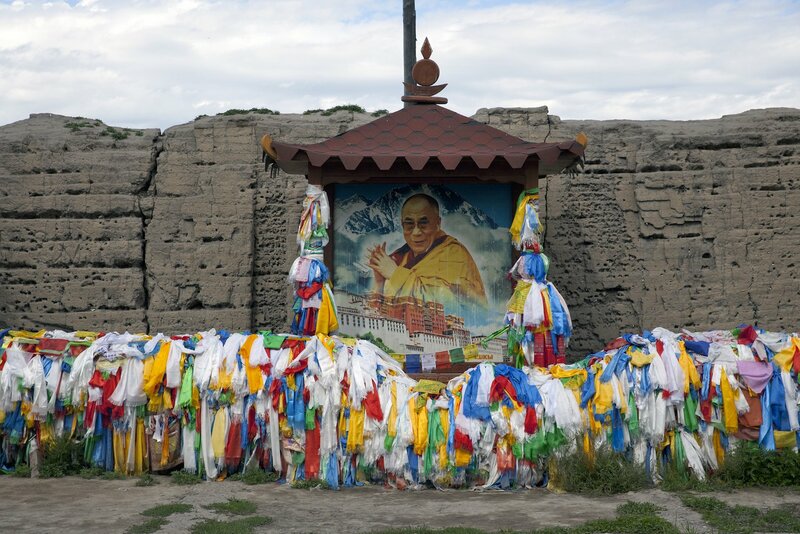 This portrait of Dalai Lama is all that remains from the 1908 Buddhist sanctuary Ustuu-Khure outside Chadan in western Tuva. At the time of its completion, it was an important center of Tuvan nation-building: the first Tuvan alphabet was developed here, as was the first coin. The monastery was built by the order of the local noyon (tribal ruler) Khaidyp — the adoptive father of the future founder and first prime minister of the independent Tuva, Mongush Buyan-Badirgi. After Buyan-Badirgi was arrested and murdered following a coup staged by his Communist-leaning subordinates, this monastery was destroyed and all monks arrested, some of them executed. The monastery was revived in 2008 with the support of Sergei Shoigu, Russia’s current defense minister (then Emergencies Minister), a native of Chadan. Shimitsi Khumbun, 79 (pictured here with her granddaughter Sanchira on her knees), has been living in the Kachyk river valley since birth. She has 16 children, around 90 grandchildren and 19 great-grandchildren. Standing left to right are Khumbun’s grandchildren: Angarmaa, Buyana, Gazhidmaa, Sanchay, and Nachyn.